Optimus Maximus in full configuration has a screen in each key that displays the function currently assigned to it. Optimus Maximus’s customizable layout allows convenient use of any language—Cyrillic languages, Ancient Greek, Georgian, Arabic, Quenya, hiragana, etc.—as well as of any other character sets: notes, numerals, special symbols, HTML codes, math functions and so on to infinity. Any key (or to be exact, a unit consisting of a clear moving cap, a microchip and a display) can be easily removed by hands to be cleaned or replaced. 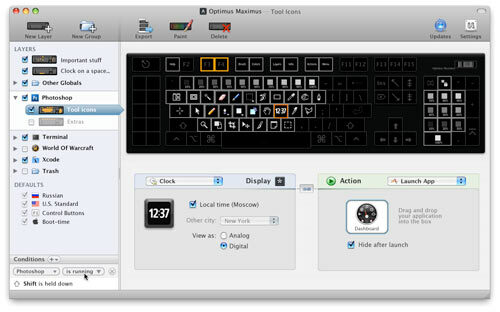 Optimus Configurator software enables users to program each button to reproduce a sequence of symbols and edit images separately for each layout.